Get rid of unsightly and uncomfortable leg veins! Chronic venous insufficiency is referred to the sequence of changes which may occur in a leg when its veins do not function properly. The term chronic venous insufficiency simply describes the fact the vein valves are incompetent or that the veins which return the blood from the legs to the heart are insufficient, but it is more appropriately used in cases when skin changes have developed as a result of long-standing venous hypertension and stasis (Gloviczki P, Yao JST. HANDBOOK OF VENOUS DISORDERS: Guidelines of the American Venous Forum, 2001). The term chronic venous insufficiency should not be confused with the term chronic venous disease! The veins of the legs function as conduits which return oxygen-poor blood from the legs to the heart. This is achieved with a series of folds of the lining of the veins, called valves, which open to allow the blood flow towards the heart, and close to prevent blood from flowing backwards to the feet. This way, blood flow in the veins is never directed away from the heart. Certainly, in order that the leg veins function properly, normal function of the calf musculo-venous pump is required. The pump’s role is to push the blood from the leg towards the heart against gravity, as occurs during walking. In certain situations, the valves do not function properly, but “leak” (“incompetent valves”), and the blood refluxes backwards to the feet. As a result, pooling of blood occurs in the veins of the lower part of the leg (high venous pressure or venous hypertension) and in the leg tissues (venous stasis). There are 3 different reasons why chronic venous insufficiency may develop in a person’s legs. Occasionally, two and more rarely all three conditions co-exist in the same person. When there is valvular incompetence with reflux affecting the superficial veins (i.e. 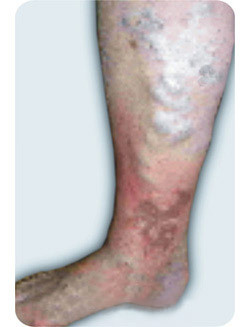 the veins directly under the skin), skin changes with or without varicose veins may develop. When there is valvular incompetence with reflux affecting the deep veins, leg oedema (swelling) and skin changes may appear. If the damage of the valves is the result of a previous episode of deep venous thrombosis, the condition is called “post-thrombotic (or post-phlebitic) syndrome”. When there are factors not allowing the calf musculovenous pump to function properly (such as weakness of the calf muscles, loss of ankle joint motion, inability to walk), the sequence of changes leading to chronic venous insufficiency may be triggered. When the valves of the leg veins do not function properly, the blood is allowed to reflux backwards to the feet having a two-way flow and to pool in the veins and tissues. This venous stasis may have untoward consequences. In the gaiter area of the leg, the skin and the fat tissue under the skin become fibrosed, or ”sclerosed” (a condition called lipodermatosclerosis). The skin colour changes to dark brown (discolouration) because of deposition of haemosiderin from destructed red blood cells, and patches of atrophy with white colour (“white atrophy”) may develop. If this condition isn’t treated, leg ulcers often occur and cause disability and distress. In a swollen (oedematous) leg, especially with skin changes, CVI can be suspected mainly if varicose veins are present, if there is a past medical history of deep venous thrombosis or if there are other factors reducing the efficiency of the calf musculovenous pump. The vascular surgeon may opt for ambulatory venous pressure (AVP) measurement, which is the gold standard to assess the efficiency of the calf musculovenous pump and is an invasive test. It is performed by using a small needle into one of the veins on the back of the foot and connecting it to a blood pressure measurement machine. The differential diagnosis of leg oedema may also be aided by duplex ultrasonography of the veins of the leg. The best studies are performed by doctors fully trained in vascular ultrasound scanning. The goal of the management of CVI is controlling the swelling of the leg. This can be achieved by using graduated compression stockings, which, of course, are more tight than ordinary stockings. You can generally use below knee stockings. Stockings that apply well prevent leg swelling to a very satisfactory degree, this way averting the consequences of CVI. In cases when CVI is caused by varicose veins, varicose vein surgery can be very helpful. Your vascular surgeon will assess your vein problem and advise you whether varicose vein surgery may be of benefit. The earlier you see the vascular specialist and start treatment, the better the outcome and the lower the risk for any future problems related to this uncomfortable condition will be. Avoid prolonged standing and having a sedentary life. If you need to remain seated for a long period of time, interval walking for a few minutes or flexing the leg will help. Elevate your legs over the heart level, whenever it is possible. Do not wear tight clothes. Avoid obesity. Avoid exposing your legs to the direct sunlight or other sources of heating. Follow your doctor’s advice in regard to the use of compression stockings.